Hope this journey across India has expanded your palates to accommodate the diversity in our food culture. Today, our last stop in this series is West Bengal and I end this series on a sweet note. Special thanks to Srivalli for initiating this series and to all fellow marathoners who made this a very enjoyable journey. Hope all of you will continue this journey in any small way possible in your respective kitchens. A few words about West Bengal before the recipe. *West Bengal has been in the center of our history. It was a home state for many stalwarts of India like Rabindranath Tagore, Subhash Chandra Bose, Raja Ram Mohan Roy etc. *Bengali literature is very rich and has a long tradition in folk literature. *Rice and Fish form a major part of their cuisine. Please join me for a lovely, mouth watering dessert from this state..
*Condensed milk can be used to make it richer and thicker and also to reduce the cooking time. *Corn Flour / Rice Flour can be used as a thickening agent. Knead the fresh paneer well and make small roundels of them and set aside. Boil milk under a reduced flame until it is reduced to 1/2 or 3/4 of its quantity. Add sugar and the saffron. Take care to make sure the milk doesn't get burnt. So continuous stirring is a good idea. Gently drop the prepared paneer balls into the simmering milk. Let it simmer for a few more minutes. Remove and refrigerate upon cooling. Serve chilled for a delightful dessert! After tasting the rich Lucknowi Dahi Vade, it is the turn for this traditional dish from Uttarakhand, formerly Uttaranchal. It is a relatively new state, carved out of Uttar Pradesh in 2000. Uttarakhand is also known as the 'Land of the Gods' due to the various pilgrim centers and temples. Visiting Badrinath and Kedarnath are considered very auspicious by Hindus. It is also known for its natural beauty and many tourist spots like Dehradun and Nainital. The state is divided into two provinces, Garhwal and Kumaon. Coming to the recipe for today. I understand that this is made during weddings and other festive occasions. This is a typical Garhwali dish. Finally after covering all the 'Seven Sisters', it feels like we have captured the world! Now onto Uttar Pradesh. This state has been in the center of Indian History and Mythology. The land of Lord Ram, home to many historical happenings and lots of places of worship - Uttar Pradesh. Their cuisine is multi faceted. So many influences in their cuisine and they have one of the richest variety. Here is a very unique one which was a delight to have! Enjoy this burst of flavors as I move on to the neighboring state of Uttarakhand formerly Uttaranchal. After a traditional festival dish from Tamil Nadu, we are stepping into a very physically isolated state, Tripura. This state is surrounded by mountain ranges on all sides and is connected to the rest of India through just one national highway. This has greatly hindered progress in that state. Culturally they have a diverse ethno-linguistic groups resulting in a composite culture. Their cuisine is typically meat and fish based. Trying to figure out suitable vegetarian dishes was a great challenge. So finally I had to try some vegan alternative to their dishes. Here is one which I tried with Sauteed Tofu instead of Berma (a form of fermented fish which is pretty common in Tripuri cuisine). This one was surprisingly very popular with the kids. Try it out and see if your palates can accept this veganised version. While you are at it, it is time for me to go over to Uttar Pradesh. Catch you all there with a delectable dish! After the beautiful trip to Sikkim, lets peep into Tamil Nadu, the land of the ancient Hindu temples and the classical dance form, Bharatnatyam. For most of the country, Tamil Nadu symbolizes Idli, Sambar, Dosa and Vada. In fact there was a time when the people in the North addressed the south Indians 'Madrasis'. Not so now. Now each state has established its own identity. Coming to this traditional Kalkandu Pongal, it is made on auspicious occasions and offered to the Lord as well. The rich, creamy texture is very addictive. Drool over the creamy pongal while I travel to Tripura. Though Tripuri cuisine gave me nightmares, I have hit upon a wonderful vegan variation which was a super hit at home. Lets talk more about that tomorrow. See you there! I hope you were happy with Gatte Ka Pulao from Rajasthan. Today, lets explore the cuisine of Sikkim which is land locked on all sides and is surrounded by the Himalayas. It is a popular tourist destination owing to the picturesque locations. Their cuisine is primarily noodle based and momos figure prominently on their dining tables. But here I feature this snack which is very healthy and unique in taste. I have come to know that these fritters (without the spring onion) are fairly popular in other parts of the country specially during the fasting days, locally known as 'Vrat Ka Khana'. After visiting the Food connoisseurs of Punjab, lets visit the Desert region of Rajasthan. It is aptly named as The land of Kings as historically there were numerous kings who ruled that region. The Rajasthani cooking has been influenced by the lifestyle of the people and the ingredients available in the desert regions. So their food is such that can last several days without the need for heating. This pulao is on similar lines with the Gatte being made well in advance and used in the pulao. We found the pulao to be very flavorful and spicy and threfore enjoyable. The kids had some trouble taking in so much of spice! While you check out the pulao I shall await your arrival in yet another North Eastern state of Sikkim. I hope the Indo-French Butternut Squash-Potato Bisque was interesting enough yesterday. Today let us enjoy this simple everyday kind of roti from Punjab. Punjab also known as 'the land of 5 rivers', is very fertile and so agriculture is a very flourishing industry. The Punjabis are basically very good food connoisseurs. They love their parathas in many forms and their food is very rich and often times healthy. I had plans of making the classic combo of Makki Ki Roti and Sarson Ka Saag but I shall reserve it for sometime later. Lets check out this Missi Roti. Missi means mixture. These rotis are typically made impromptu. The kids love these kind of rotis and so these rotis saved the day for me :). While I prepare for the next hop in our journey, enjoy these rotis. Our journey across India has entered almost the last phase, this being Day 22. Lets visit the Union Territory of Pondicherry or Puducherry (Meaning a new village) or affectionately called Pondy. It is a former French Colony. When I think of Pondy, I think of Aurobindo Ashram and the beautiful beaches. The four official languages of Puducherry are Tamil, Telugu, Malayalam and French, with English being a bridge, so to say. As a result, Pondy cuisine is influenced by Tamil, Telugu, Malayalam and French cooking. The Indo-French cuisine is the popular one there. So this Butternut Squash Potato Bisque felt like an apt representation of the Pondy cuisine. We found that this soup was very filling. The next time I shall try it with low fat milk and see if there is any perceivable difference in taste. Slurp the soup here while I am off to Punjab, the land of five rivers. Hope you loved the snack from Nagaland. Now it is time for us to move on to Odisha or formerly, Orissa. I identify Odisha from their dance form, Odissi and also the famous Puri Jagannath temple. Their culture is very close to Bengali and Assamese and so they share a similar cuisine. Here this Buta Dali is also made in Bengal and Assam as I understand. I have also come across variations of Buta Dali and this one was favored at home. While you check out if this version of Buta Dali works for you, I shall have to go to Pondicherry now to make sure all is well with that post! See you there! Hope you enjoyed the plain soup from Mizoram yesterday. Let us move on to Nagaland today with some of my personal stories. In an earlier post I had mentioned that we lived in Assam for 4 1/2 years in a place called Bokajan. It is very close to the Nagaland border and Dimapur in Nagaland was the nearest (10 kms) town for us. 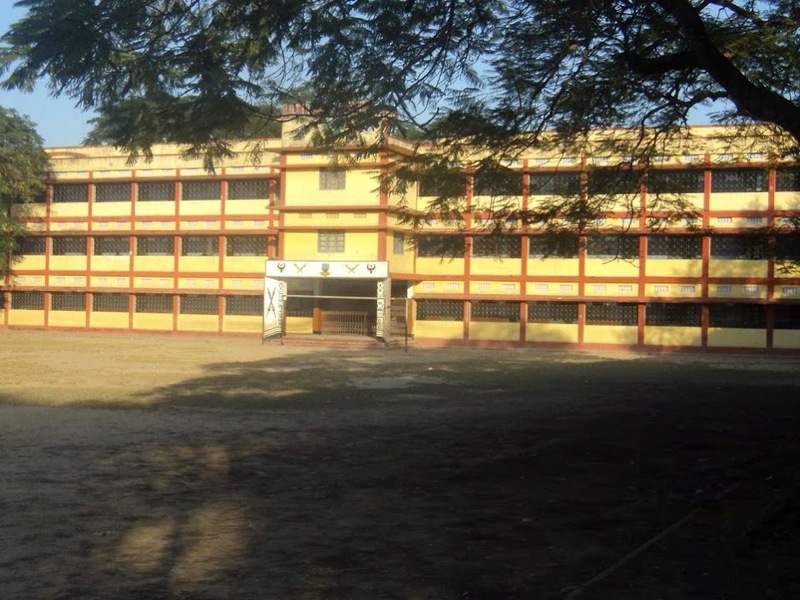 We (my brother and I) attended a missionary school (Holy Cross School in the picture below) in Dimapur. We had a school bus which would take all the kids from the campus in Bokajan to the school in Dimapur and I vividly remember we used to pass through rows and rows of pineapple bushes and lush green Tea gardens. The women workers at the Tea gardens would hang a basket on their backs plucking the tea leaves while some would be smoking tobacco sitting on the side walks, waving to us in the school bus! Here is an interesting incident from Nagaland - On a particular day when we used to live in Assam, my mom and several ladies from the campus traveled to Dimapur to get their monthly groceries. My little sister who was about 2-3 yrs tagged along with my mom. While my mom was busy getting the groceries, my sister walked away and got lost. My mom and her friends were frantically looking around for the little one and describing her to the street hawkers. She was nowhere to be found. It so happened that one person mistook her for another couple's daughter and was carrying her to their house. My mom spotted the man who was hurriedly carrying the crying toddler, ran up to him, snatched my sister and hugged her with relief. After all the clarifications, the crowd dispersed and all was well in the end!! It is etched in our memories (specially my moms') for the ordeal it would have been!! Also it was rumored that there were many human eaters in the surrounding villages and they routinely kidnapped the kids and sacrificed them. On another front, did I talk about the Naga Shawls?? They are the best for the winters in India. They have a typical pattern with Red, Black and white colors. If I am not wrong, the shawl is safe and in excellent condition even today with my dad after almost 3 decades in usage. Here is a picture of a typical Naga shawl..
Coming to the food part, it was extremely difficult to find vegetarian food to showcase here. After looking up on many websites, I figured out that Koat Pitha is their favored dessert at all important occasions. I am told that they share this addictive dessert with their neighbors in Assam. Enjoy this cousin of Adhirasam/Athrasam while I travel to Odisha (Formerly Orissa) and prepare some comfort food. Welcome to Mizoram, after a taste of the Khasi cuisine in Meghalaya. Mizoram is another of the north eastern states where authentic vegetarian food is hard to find. Most of the vegetarian food is typically boiled vegetables and so this watery soup with boiled vegetables is all I could make which fits the bill. Though the soup sounds very simple, it was a delightful one to have on a wintry evening. While you savor the simple soup, I shall go over to Nagaland and get the snack ready for you. After tasting the dessert from Manipur, Lets just hop over to another state, Meghalaya, right here in the North East. As I have mentioned previously, We lived in the neighboring state of Assam for 4 1/2 years. And I can't say I remember ever travelling to Shillong :). As I understand, this state is also dominated by different tribes and the Khasis are a dominant tribe here. I had tough time looking out for authentic vegetarian recipes for this state as well. But when I saw this article, I thought I can work around the information in that article. I made this Ja Dai (Ja=Rice, Dai=Dal) and my husband pretty much enjoyed it with Aloo-Gobi, which was a surprise! This is essentially a bland version of Khichdi, so a spicy curry is perfect to enjoy the ginger flavored khichdi. After an addictive snack from Maharashtra, it is time to take a quick peek into Manipur, another North Eastern state for a unique dessert. One thing which strikes a chord about Manipur is their famous Manipuri dance. It is mesmerizing, to say the least! Anyway, coming to the research of vegetarian dishes, it was very hard for me to lay my hands on some authentic vegetarian dish. Luckily, I finally found this unique dessert which is very popular in Manipur. This dessert calls for fried chickpea dumplings soaked in sweetened milk. I agree that our palates need some adjustment to appreciate this dessert. But my little one (so was I) was intrigued and enjoyed consuming this dessert! Check if you are adventurous enough to taste this while I travel to the neighboring state of Meghalaya, which gave me an equally hard time figuring out their vegetarian options :). When one thinks of Maharashtra, one thinks of Mumbai (the city of opportunity), Pune, Nagpur etc. in that order. And when one thinks of food, then the street food from Mumbai figures prominently. But here is a very traditional and a now-forgotten recipe from the coast of Maharashtra. Thanks to my friend, Shalaka, who shares my passion of digging out forgotten recipes, this has taken a prime place on our dining table. Shalaka says, it was a childhood favorite of hers and she rarely prepares this at home today. I shared some of what I prepared at home and she was pleased to have it and become nostalgic over it. Traditionally, the batter is wrapped either in Turmeric leaves or banana leaves and then steamed. As with everything, the modern cook has improvised it to steam in the idli-moulds to suit his/her convenience without compromising the quality of the snack. Trust me when I say it is addictive. Check for yourself while I am off to the NE state of Manipur. *Decorate by adding cashews. Or Sprinkle some Sweetened coconut flakes for a festive touch! In a heated pan, add ghee and roast the rava/sooji until it is golden brown. Blend sugar, milk, yogurt, coconut, mango pulp in mixer. Transfer the blended mixture into a mixing bowl, and gradually add the roasted sooji. Make sure there are no lumps. Sprinkle a pinch of soda and gently mix. Pour ladle full of batter in each of the idli-moulds (top it with a cashew on each) and steam for 15 minutes. Remove and serve hot as a snack and enjoy the coconutty-mango flavor. Garnish as per your fancy. Welcome to Madhya Pradesh. Madhya means Central, Pradesh is Region. So as the name suggests, it is situated in the central region of India. Vast areas of this state are inhabited by the various tribes and each tribe has a distinct food culture. Madhya Pradesh reminds of the terrible tragedy of Bhopal. It was termed as the world's worst industrial disaster which claimed more than 10,000 lives and affected about 500,000 people. Coming to the cuisine, Indore is known for its street food and from what I gathered, these Palak Puris are to be had only in the streets of Indore, if you get the meaning :). My kids loved these puris so much that I had to make them a second time on the same day. While you munch the puris here, I shall hop onto Maharashtra and prepare a yummy and unbelievable snack. Let us cool off a little in Kerala today. Kerala also known as 'God's Own Country', is a coastal state in South Western India. I identify it with its Backwaters, Elephants and Coconuts. Oh! don't forget Kathakali (a dance form) and Onam. I have chosen to present a simple Sadya recipe from Rajani's space. As I understand, Sadya means a festival menu. And they have an array of dishes and are supposed to be made and served in a particular order. Kichadi is otherwise known to us as Raitha/Perugupachadi. I had never heard of Beetroot Raitha and so tried it out. Check it out while I travel to Madhya Pradesh just a day ahead of you to check out the place! After the Jharkhandi snack yesterday, let us come down south to Karnataka and taste their snack as well. My personal connection to Karnataka is through my paternal grand father who moved from Bellary in Karnataka to settle down in Gooty, Andhra Pradesh almost a century back. So my dad and his siblings were treated to a lot of variety in terms of food. Since my grandpa was the head of a large family, he offered shelter to a few of his widowed aunts and cousins who lent a hand in the kitchen bringing in the 'Karnatic touch' in the food dished out at home. My mom apparently ate these Bondas/Fritters as a young bride almost 50 years back. She says it used to be an instant snack made when unexpected guests pop in at tea time. She also notes that the original recipe (as made by the previous generation) doesn't include the Sooji/Semolina/Rava but it has slowly absorbed some changes over a period of time. Moreover in those days, usage of onions was strictly not allowed and so the basic ingredients of flour, sour curds, salt and green chillies were enough to dish out these tangy cuties! Try them out while you are here. Meanwhile, I shall drive down to the neighboring state of Kerala and see what I can come up with. See you all tomorrow! I am hoping that this journey across the Indian states is keeping you all entertained as well as keeping your tummies from (g)rumbling! Jharkand is a relatively new state formed in 2000. It is primarily a tribal dominated state. And the cuisine there is very similar to the Bihari cuisine. Let us not waste too much time with idle talk, lets get ready to take a peek at a Jharkandi(?) snack which has been made multiple times at our place owing to its popularity. Apparently, Dhuska is a festival snack and is typically made during Durga Puja and Holi. Take a bite while I hop over to the southern state of Karnataka. Join me there tomorrow for another snack! Our next stop after Haryana is the neighboring state of Himachal Pradesh, which literally means 'In the lap of the Himalayas'. It is a beautiful state and is easily identified by 'Kulu-Manali'. The food there is pretty much the same as the entire North India but there are some specialties, like this recipe, Bhey. It is made using the lotus root or stem. Check out this interesting curry while I cross the state border over to Jammu And Kashmir and prepare for your visit! I am sure you all enjoyed the Poha Dhokla from Gujarat. Now it is time to explore the state of Haryana and yet another healthy, Diabetic friendly recipe from their realm. Haryana has been carved into a separate state from Punjab in 1966. So it is very difficult to separate the cuisine of Haryana from Punjab. But my friend, Pooja, who hails from Amritsar, has helped me in this regard by guiding me through the process of identifying the typical food made by Haryanvis. While you slurp this filling Khichdi I shall hop over to Himachal Pradesh and see if everything is ready for your trip there! After enjoying the beaches in Goa, lets go over to Gujarat, known as the 'Jewel of the West'. Gujarat reminds me of some great stalwarts like Mahatma Gandhi, Sardar Patel. But personally, the stories told by my mom from the time they lived in Dwaraka, the coastal city, stand out most in my mind. My parents lived there during the Indo-Pak war in 1971. Apparently, they had to undergo rifle training and all the other mechanics which were common practices in a war zone. Lights out during the night was a common thing too. It was very exciting for us, as kids to listen to all the war time stories which my mom had to tell us. But I must say, it was not easy on them to go through the war time routine! By the way, don't we all associate Dhoklas with Gujarat? At least I do. Check out these healthy, instant dhoklas made with Flattened rice flakes/Poha while I smooth your way into Haryana. After the spicy, Matara Chaat in Delhi, lets peep into Goa, have a dip in the Arabian Sea and enjoy the various tourist spots here. Incidentally, Goa is a state which attracts a lot of domestic and international tourists as it is known for its beaches and world heritage architecture. Since it is part of the Coastal area of Western India, sea food forms part of its varied cuisine. Goan food can be divided into Goan Catholic and Goan Hindu cuisine each with distinct charateristics, cooking styles and tastes. Xacuti in its non-vegetarian form is very popular with the natives. I have attempted the vegetarian version which was a delight to have. Check it out for now while I am off to take you through the nearby state of Gujarat. From Chattisgarh, lets move onto Delhi, the capital city of India! Delhi is known for its rich historical heritage and food. As a Mughal capital, Delhi influenced the food habits of its residents and it is where the famous, Mughlai Cuisine originated. The fast living habits of the people in Delhi has motivated the growth of several street food outlets. And dining in Dhabas has become a very popular trend among Delhiites. The Gali Paranthe Wali is a particular favorite of food enthusiasts in the city. It is said that there are hundreds of varieties of paranthas served in that particular street alone. Since we are talking about the street food culture in Delhi, it is to be noted that every street has a hawker/outlet selling this Matara Chaat or Matara Kulcha which is something not to be missed when one visits Delhi. So have a visual taste of this delicious street food here while I prepare for the journey onto the next state, Goa. Welcome to the state of Chattisgarh, which is relatively a new state formed in 2000 carved out of the state of Madhya Pradesh. My personal connection to Chattisgarh is through my brother who lived in Bilaspur for more than 5 years and contributed a lot in the automation of lot of financial services in his department. They have forged many friendships in the area and are very attached to the place as well. It is unfortunate that I haven't had the opportunity to visit them while they were there. It is known as the rice bowl of Central India and most of the food is rice or rice flour based. But today's dessert/snack recipe is an exception as it is wheat based! Trust me when I say that these are extremely addictive and healthy as well. While you check out these Khurmis, I shall make sure that our next leg of the journey goes unhindered! After a nostalgic trip in Assam, lets step into Bihar, which has a long mythological and historical heritage. When I think of Bihar, I think of the rich fertile land and so many rivers and tributaries flowing and not to forget Bodh Gaya. The famous Bodh Gaya is the place Lord Buddha attained Enlightenment. Bihar has a huge production of Litchi, which is one of our favorite fruits and unfortunately we pay a pretty penny for these cuties out here :(. Madhubani paintings, the eminent musician, Ustad Bismillah Khan are more identities of Bihar. Coming to the food, Bihari Cuisine is predominantly vegetarian owing to Buddhist and Jain influences. Sattu, which is roasted gram flour, makes a prominent appearance in many households in many forms. One such is this form of paratha, Makuni, also known as Sattu Ka Paratha. It is traditionally eaten as breakfast but it works fine as a snack as well as part of dinner. Lets meet again tomorrow in the state of Chattisgarh which was carved out of the central state of Madhya Pradesh. While we are here in the NE region, lets take a peek into the neighboring state of Assam. This state has a special place in my life as I spent 4 1/2 years of my childhood in this state. I confess I cannot talk about the life there like a pro, but I do have certain distinct recollections of our stay there. But keep in mind that my memories are more than 30 years old. We used to live in a Cement Corporation Of India colony in a city/village called Bokajan in Assam. This place was so remote that I remember my mom used to go to the nearest city of Dimapur, Nagaland, for all the groceries once a month in a company vehicle. There used to be a weekly farmer's market in the vicinity of our colony which took care of our vegetable needs. My brother and I used to go to school in Dimapur, Nagaland, which was an experience in itself. I shall write more about our schooling when we visit Nagaland in a few days :). Most of the native tribes there have looms in their houses and they traditionally weave saris called Mekhla, once in a year for their New Year, Bihu. Bihu, reminds me of their traditional Bihu dance which is a sight one cannot forget!! As a child I clearly remember my brother and I used to crave for the Vegetable Khichdi which used to be served as Prasad in a container fashioned out of a plantain trunk, in the neighboring temple we used to visit. I also remember my mom telling us that there was never a single sighting of crows in the area. Apparently crow meat is a delicacy and the crows are almost never found there. But we once visited a bird sanctuary in Sibsagar (Shivsagar) where the crows were unusually huge with a wing span of about 3 feet. We were told that those crows were the only ones in the whole of Assam! My mom recollects that the natives never had fear of robberies in their neighborhood and most of them never locked their homes either. Also each house was separated by vast lands and every house/cottage had a small pond where they cultivated their own fish. They are extremely hard working people and have strong communal bonds. Their marriages are performed by a very simple assembly of all the people in a community sitting together and the bride and bridegroom picking each other willingly with no restrictions as to the dowries or other financial issues. Now after writing down my memories, I am tempted to make some Vegetable Khichdi and some Bilahir Tok (Bilahi = Tomato, Tok = Sour) for my lunch today. Apparently this sweet, sour and spicy accompaniment is made on most of the festivals and important occasions. Go ahead and drool over the Bilahir Tok while I plan our next trip to the state of Bihar. See you there tomorrow!! After starting our journey in the Southern state of Andhra Pradesh and tasting their delicious sweetmeats, we are all set to step into the North East today. Lets see what this land of the rising sun has in store for us today. Arunachal Pradesh is one of the seven North Eastern states where various tribes reside. Its is one of the seven sisters as the group of states in that region are commonly referred to. Arunachal Pradesh is situated at the Northeastern tip of India. Out of many tribes who live in this state, the Monpa tribe of West Kameng is one. The West Kameng district is named after the tributary of River Brahmaputra, called River Kameng. The economy of the Monpas is basically agrarian and rural based. Khapse are made out of Amaranth Flour (commonly known as Rajgira Flour). Amaranth, known as Bungandmo in the native language, is a very precious crop of the Monpas and is conserved by the women. But due to certain factors, the cultivation of this crop is now found only in a few remote villages. Therefore its economic value has increased by 4-5 folds. Traditionally they are shaped into eight-shaped rolls and fried in mustard oil until crispy. They are stored in well-aerated bamboo containers for up to an year. Today our Blogging Marathon Group members are embarking on an Indian Food Odyssey journeying across 30 states and Union territories of India. Our idea is to highlight the diversity and similarities of the food culture across the states. So lets delve deeper and satisfy our thirst for exploring the various cuisines. The series starts with my home state 'Andhra Pradesh', the home for most(all?) people identifying with 'Telugu' as their mother tongue (That is one way how I define my home state :) ). With the latest division of our state, many of us find it hard to digest the division and create an identity for the breakaway state, 'Telangana'. I have no political inclinations or aspirations but nonetheless I find it hard not to express my feelings. Coming to today's recipe, these sweetmeats are kind of an identity to the city of Kakinada. There are different variations in the preparation of these Kajas or Madatha Kajas as they are also referred to. This is the version I am comfortable with and have seen many of my friends make them at home. I have verified this fool-proof recipe umpteen times with my friends and decided to take the risk of making these delicious 'crisp on the outside, juicy on the inside Kajas' and enjoyed with my friends and family. Please note that I have deliberately made them bite size as a way to portion control and minimize wastage when served/offered to kids. Enjoy them for festivals, momentous occasions or just parties/potlucks :). In a mixing bowl, add the flour, baking soda and ghee. Rub in the ghee into the flour to resemble bread crumbs. Add in sufficient water and knead into a stiff dough. Cover and set aside for 15 min. Divide the dough into 15 equal portions and work with 3 portions at a time while keeping the remaining covered. Roll out one portion of the dough into a thin circle (like a roti/puri), add a little ghee and sprinkle some rice flour. Pat the ghee-rice flour mixture evenly all over the rolled out dough. Roll out another portion of the dough and layer it on the first one. Repeat the ghee-rice flour mixture routine for the second layer as well. Roll out the third portion and place it on top of the second one. Flatten each piece as in fig 4. Repeat the rolling the rotis, layering them, jelly-rolling them, slicing them and flattening them for the remaining dough. To prepare the sugar syrup - Add 1 1/2 cups of sugar to 3/4 cup of water and let it boil. Let it simmer until a single thread consistency is achieved. Sprinkle the cardamom powder and set aside. Heat oil in a kadai/wok and make sure the oil is not too hot. Reduce the flame to less than medium. Gently slide the flattened pieces into the medium hot oil and let them cook through. When they are all uniformly browned, remove using a slotted spoon and dunk them in the warm sugar syrup. Make sure the syrup remains warm throughout the process. After about 10-15 minutes, remove the kajas from the syrup and let them air dry. Continue the frying, dunking in the syrup, removing and air drying until all of them are done. Once the syrup dries, store them in an air tight container and enjoy them. They should be firm from the outside and juice from the inside.